In 2015, Intel launched its 6th generation Core, codenamed Skylake, that implements a new ISA for security – Intel® SGX. 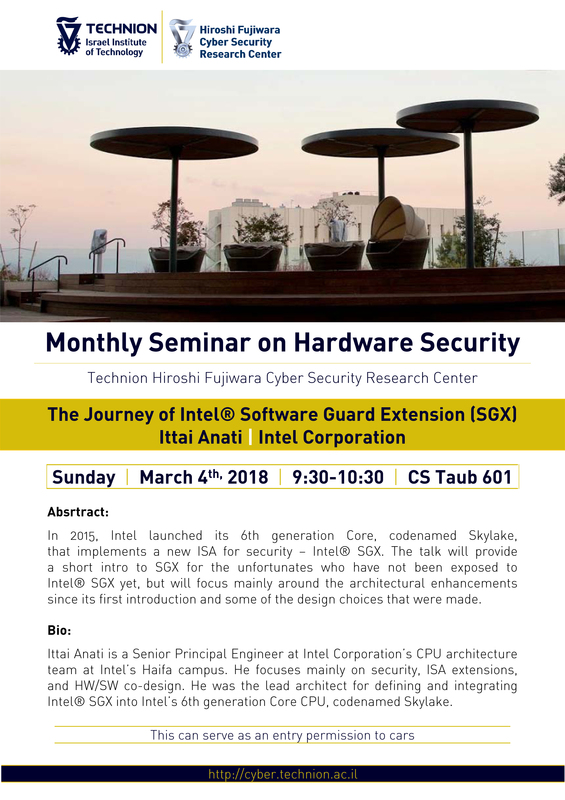 The talk will provide a short intro to SGX for the unfortunates who have not been exposed to Intel® SGX yet, but will focus mainly around the architectural enhancements since its first introduction and some of the design choices that were made. Ittai Anati is a Senior Principal Engineer at Intel Corporation’s CPU architecture team at Intel’s Haifa campus. He focuses mainly on security, ISA extensions, and HW/SW co-design. He was the lead architect for defining and integrating Intel® SGX into Intel’s 6th generation Core CPU, codenamed Skylake. This can serve as an entry permission to cars.